I graduated with a BS in animal science from Cornell University and a MPH in community health education from New York University. I've been a health educator in a teen clinic for nearly two decades. Working with adolescents, I've learned that unless mental health issues are addressed, it is very difficult to concentrate on life. Mental health issues impact a person's relationships, the ability to learn in school or hold a job. I currently work with a group of high school youth and have collaborated with them on community-based theatre presentations focusing on mental health issues from stress, anxiety, and depression to unhealthy relationships. I have published a chapter on youth engagement and I have made numerous presentations at conferences over the years on health education, mental health, and youth engagement. I have many years of experience with program planning, including starting new programs from the ground up. 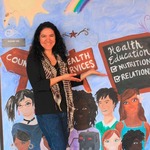 In 2011, I started the doctoral program in health education at the Loma Linda University, School of Public Health. I'm currently completing my DrPH in health education with a cognate in psychology. In 2014, I was honored to receive the Ruth White Doctoral Scholarship. Through my work and educational experiences, my passion for mental health education has grown. During my grad school journey at Loma Linda University, I've embraced the body and mind connection even more. We are "whole" beings and we cannot separate the body and the mind; we need to take care of whole person. Please see my LinkedIn for more information about my background. Thank you to all my backers for donating to my project! I'm very excited to get started in the next phase of outreach! 98 surveys completed! Another sighting of my dissertation flyer at Polly Ann Ice Cream in the Outer Sunset! Natalee, thank you so much for your kind words and support! I'm really proud of the work we do together at the clinic! Hi Adrienne, Thanks for your post! What's your major at SLU? My study is San Francisco-based, so if you know of young adults or colleagues in the area, tell them about my online survey. My study website is here: www.helpingyoungyadults.com You can also spread the word about my experiment.com/youngmillennials. Thank you Judy. This topic is very near to my heart. Sure! Thanks for asking. I'm synthesizing and modifying two surveys: one on mental health literacy (Reavley et al 2014) and theory of planned behavior (TPB) on help-seeking (Mo & Mak, 2009). For the MHL, the researchers not only assessed depression, but also anxiety disorders and schizophrenia. They also had a huge n (6019); their survey was done by phone in Australia. The participants who take the online survey are given a vignette of a young person exhibiting some type of mental illness; I want to see if they recognize it, then they are asked how that person can best be helped (variety of interventions from medication to diet). Based on their answers, there is a MHL score that sums up their MHL on the specific mental illness I'm studying. I'm using the constructs of TPB to assess help-seeking (attitudes, subjective norms, perceived behavioral control, MHL (score), and perceived barriers). For the TPB, I'm having them imagine that they are the person in the vignette. There are background factors (variables) that may predict help-seeking intention, so the ones I'm using are: gender, race/ethnicity, educational level, acculturation, parenthood, mental health status (I'm using the PHQ2), knowing someone with mental illness, marijuana & alcohol use, and mental health service utilization. Some feedback I've received from people who have taken the survey is that it's "the best MH survey I 've ever taken" to "it was fun to take." It's brief (no more than 15 minutes), they can use their smart phones, notebook, or laptop, and it's available in English, Spanish, and Chinese. I posted my references in the lab notes which include the researchers mentioned. Thanks again! Sure! Thanks for asking. I'm synthesizing and modifying two surveys: one on mental health literacy (Reavley et al 2014) and theory of planned behavior (TPB) on help-seeking (Mo & Mak, 2009). For the MHL, the researchers not only assessed depression, but also anxiety disorders and schizophrenia. They also had a huge n (6019); their survey was done by phone in Australia. Mine will be covering only depression with suicidality. The participants who take the online survey are given a vignette of a young person exhibiting depression with suicidality. I want to see if they recognize the depression with suicidality, then they are asked how that person can best be helped (variety of interventions from medication to diet). Based on their answers, there is a MHL score that sums up their MHL on depression with suicidality. I'm using the constructs of TPB to assess help-seeking (attitudes, subjective norms, perceived behavioral control, MHL (score), and perceived barriers). For the TPB, I'm having them imagine that they are the person in the vignette. There are background factors (variables) that may predict help-seeking intention, so the ones I'm using are: gender, race/ethnicity, educational level, acculturation, parenthood, mental health status (I'm using the PHQ2), knowing someone with mental illness, marijuana & alcohol use, and mental health service utilization. Some feedback I've received from people who have taken the survey is that it's "the best MH survey I 've ever taken" to "it was fun to take." It's brief (no more than 15 minutes), they can use their smart phones, notebook, or laptop, and it's available in English, Spanish, and Chinese. I posted my references in the lab notes which include the researchers mentioned. Thanks again!